The “whenever you cast a [this block’s theme] spell, do [something]” card is an established trope that we’re very used to seeing by now. 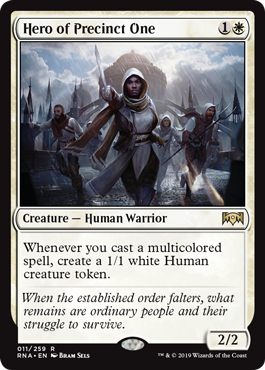 Hero of Precinct One is a particularly useful example of it, though, simply because it’s a creature and if worst comes to worst, you can just attack the opponent or their Teferi with it. There may not be enough cheap multicolored spells in Standard right now to truly overrun an opponent in a rapid fashion, but that little extra advantage can certainly help with convoke cards or with having extra things around to sacrifice. For larger card pools, I think there could be an interesting deck based on this guy and lots of hybrid mana spells like the ones from Eventide. The popularity of multicolored cards means that the Hero is only likely to get better as time goes on and more sets come out, so don’t forget about it! Everyone needs a hero, and this one is well-suited for a block with more multicolor than average. Casting a multicolor spell gets you a friend, which seems to dovetail nicely with all of the white guilds’ strategies in this block (Azorius less than others, but even they like warm bodies on occasion, and some of their cards work well with warm bodies; the other three guilds love more friends). A 2/2 for 2 is also always an acceptable rate of return, particularly one with an upside like this, and so Hero of Precinct One stands out as a fairly good, albeit not particularly flashy, inclusion to the current Standard environment, especially with a lot of hybrid spells or cheap spells otherwise.